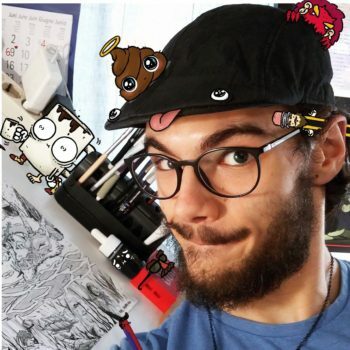 My name is Luís Moreira and i’m an Illustrator, Designer & Cartoonist. With an incredible passion for everything that as to do with cartoon, illustration, animation and design, i constantly work in order to improve my skill and increase my knowledge. Bachelors degree in multimedia communication tecnologies in ESCOLA SUPERIOR DE MUSICA E ARTES DO ESPECTÀCULO. First job was at the web design company Webcomum. Second job was as letterer and assistant producer for Miguel Montenegro the creator of Psychoducks. There is a constant improvement of technic in every developed project. I use Procreate, Photoshop to draw comic art and illustration artwork. I also am discovering Affinity Designer , and Clip Studio Paint which seem to be excellent work tools.